On April 1, 2018, the United States reached a milestone in its efforts to prevent type 2 diabetes. The Centers for Medicare & Medicaid Services (CMS) added the Medicare Diabetes Prevention Program (MDPP), a yearlong evidence-based service, as a benefit to eligible beneficiaries.1 Reaching this milestone was more than 30 years in the making. What research and Medicare pathway paved the way? What should RDs know about the MDPP and the Centers for Disease Control and Prevention (CDC) National Diabetes Prevention Program (National DPP)? And how can RDs get involved? Though we use the term "diabetes prevention," many individuals at high risk more likely will delay their onset of type 2 diabetes. Research from the DPP identified four predictive factors for prevention: achieving normoglycemia at a point during the DPP, relatively high beta-cell function and insulin sensitivity, prediabetes diagnosis at a younger age, and maximum pounds lost.5 Another study from the DPP details interindividual variation based on clinical variables measured in the baseline evaluation. Participants at highest risk of developing type 2 diabetes who lost ≥5% of their initial body weight at six months or who took ≥80% of their prescribed medication at the six-month follow up had a 39% absolute risk reduction.6 Three factors appear to be critical: early intervention, maintenance of maximal weight loss, and living a healthful lifestyle that includes sufficient physical activity. One of the CDC's roles is to translate research into programs that improve the public's health. In 2002, Congress authorized the CDC to establish and manage the National DPP.11 Since 2002, the CDC has been developing the infrastructure to scale the National DPP with both success and challenges.11 To date, more than 220,000 individuals have enrolled in this program. While this is positive, the numbers reflect just 1% of the 84 million US adults with prediabetes, according to a presentation at the American Diabetes Association 2018 Scientific Sessions in Orlando, Florida. A logical next step was to expand the CDC National DPP as a Medicare benefit. This took seven years to accomplish. The Affordable Care Act stipulates that to add a Medicare service it must achieve cost savings. To determine cost savings, a health care innovation award was given to the National Council of YMCAs in 2011 to conduct a study.12 The study enrolled about 7,000 Medicare beneficiaries. The eating plan and weight loss goals of the National DPP and MDPP are built on the evidence from the DPP study protocol.9 Over the course of the yearlong program, facilitators slowly introduce concepts of healthful eating based on the dietary guidelines. They cover many food and nutrition-related topics from healthful food preparation to how to choose foods in restaurants. A critical part of the program is self-assessment and goal setting to achieve 5% weight loss and maintain it long term. Participants must keep and submit food records and physical activity minutes weekly, and, in turn, facilitators provide them with feedback. offer the National DPP lifestyle change program by encouraging your organization to seek CDC recognition. 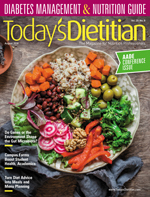 Given their skills in nutrition assessment, counseling, and evaluation, and experience in MNT, weight loss management, and diabetes self-management, RDs are well positioned to serve as program coordinators for CDC-recognized lifestyle change programs. Many RDs are trained to support clients with or at risk of type 2 diabetes, and some are already serving as lifestyle coaches in CDC-recognized lifestyle change programs. RDs serving as lifestyle coaches can continue to build their skills as strong group facilitators who can engage and motivate participants on their journey through the yearlong program. Dietitians can connect with community health workers and other paraprofessionals that have been trained to deliver the National DPP lifestyle change program to find ways to leverage the skills and expertise that each have. With millions of Americans at risk of type 2 diabetes, there are a plethora of opportunities for RDs to engage in this national public health effort. Stemming this tide, even delaying the diagnosis for several years, can decrease comorbidities and premature death. It also can help many Americans experience greater quality of life and productivity while saving health care dollars. I encourage you to engage. — Hope Warshaw, MMSc, RD, CDE, BC-ADM, FAADE, owns Hope Warshaw Associates, LLC, a diabetes and nutrition focused consultancy based in Asheville, North Carolina. She's the author of numerous and has served as the 2016 president of AADE. Currently, she serves on the Academy of Nutrition and Dietetics Foundation board. * Hope Warshaw, MMSc, RD, CDE, BC-ADM, FAADE, reports the following relevant disclosures: She serves as a consultant and spokesperson for the American Diabetes Association, Common Sensing, Johnson & Johnson Diabetes Institute, LLC, and WellDoc. She also serves on the advisory board for Eli Lilly and Company and Meredith Corporation. 1. Medicare Diabetes Prevention Program (MDPP) expanded model. Centers for Medicare & Medicaid Services website. https://innovation.cms.gov/initiatives/medicare-diabetes-prevention-program/. Updated July 6, 2018. Accessed May 28, 2018. 2. Centers for Disease Control and Prevention. National diabetes statistics report, 2017. https://www.cdc.gov/diabetes/pdfs/data/statistics/national-diabetes-statistics-report.pdf. Published 2017. Accessed May 28, 2018. 3. American Diabetes Association. 2. Classification and diagnosis of diabetes: standards of medical care in diabetes — 2018. Diabetes Care. 2018;41(Suppl 1):S13-S27. 4. American Diabetes Association. Economic costs of diabetes in the U.S. in 2017. Diabetes Care. 2018;41(5):917-928. 5. Perreault L, Pan Q, Mather KJ, et al. Effect of regression from prediabetes to normal glucose regulation on long-term reduction in diabetes risk: results from the Diabetes Prevention Program Outcomes Study. Lancet. 2012;16;379(9833):2243-2251. 6. Herman WH, Pan Q, Edelstein SL, et al. Impact of lifestyle and metformin interventions on the risk of progression to diabetes and regression to normal glucose regulation in overweight or obese people with impaired glucose regulation. Diabetes Care. 2017;40(12):1668-1677. 7. Gong Q, Zhang P, Wang J, et al. Changes in mortality in people with IGT before and after the onset of diabetes during the 23-year follow up of the Da Qing diabetes prevention study. Diabetes Care. 2016;39(9):1550-1555. 8. Lindstrom J, Peltonen M, Eriksson JG, et al. Improved lifestyle and decreased diabetes risk over 13 years: long-term follow-up of the randomized Finnish Diabetes Prevention Study (DPS). Diabetologia. 2013;56(2):284-293. 9. Diabetes Prevention Program Research Group. Long-term effects of lifestyle intervention or metformin on diabetes development and microvascular complications over 15-year follow-up: the Diabetes Prevention Program Outcomes Study. Lancet Diabetes Endocrinol. 2015;3(11):866-875. 10. Diabetes Prevention Program Research Group. Protocol for the Diabetes Prevention Program Outcomes Study. https://dppos.bsc.gwu.edu/documents/1124073/1127212/Version+4.2+May+1%2C+2016/14e782f2-2da9-47d1-a501-6004bcaee74e. Published May 1, 2016. Accessed May 28, 2018. 11. Ely EK, Gruss SM, Luman ET, et al. A national effort to prevent type 2 diabetes: participant-level evaluation of CDC's National Diabetes Prevention Program. Diabetes Care. 2017;40(10):1331-1341. 12. Centers for Medicare & Medicaid Services. Certification of Medicare Diabetes Prevention Program. https://www.cms.gov/Research-Statistics-Data-and-Systems/Research/ActuarialStudies/Downloads/Diabetes-Prevention-Certification-2016-03-14.pdf. Published March 14, 2016. Accessed May 28, 2018. 13. Centers for Disease Control and Prevention. Centers for Disease Control and Prevention Diabetes Prevention Recognition Program standards and operating procedures. https://www.cdc.gov/diabetes/prevention/pdf/dprp-standards.pdf. Published March 1, 2018. Accessed May 28, 2018. 14. National Diabetes Prevention Program curricula and handouts. Centers for Disease Control and Prevention website. https://www.cdc.gov/diabetes/prevention/lifestyle-program/curriculum.html. Updated June 19, 2018. Accessed May 28, 2018. 15. Briggs Early K, Stanley K. Position of the Academy of Nutrition and Dietetics: the role of medical nutrition therapy and registered dietitian nutritionists in the prevention and treatment of prediabetes and type 2 diabetes. J Acad Nutr Diet. 2018;118(2):343-352. 16. Preventing Diabetes in Medicare Act. Academy Nutrition and Dietetics website. https://www.eatrightpro.org/advocacy/legislation/all-legislation/preventing-diabetes-in-medicare-act. Accessed May 28, 2018.